Home Society Lifestyle 50 Surgeries to Resemble Angelina Jolie Turn Iranian Girl into Corpse Bride! 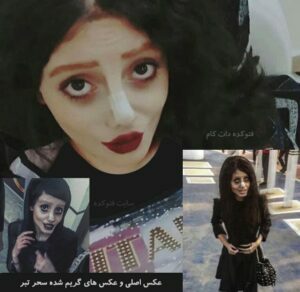 It is not yet clear whether Iranian Instagram celebrity Sahar Tabar wanted to resemble Angelina Jolie or had other intentions, and nobody knows how much of her appearance in the photographs was resulted from the surgeries she had undergone. The Belgian news site Sud Info reported that Tabar had undergone “50 plastic surgery operations in just a few months” and had lost 40 kilograms to physically resemble actress Angelina Jolie. 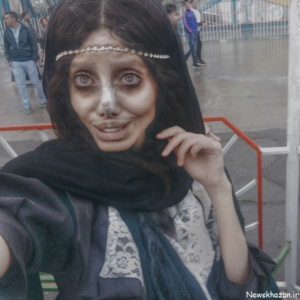 The Saudi-owned news channel al-Arabiya quickly picked up the story claiming that “many” believe her enthusiasm to imitate her screen idol has turned her into Tim Burton’s ‘Corpse Bride’ cartoon character. ‘Corpse Bride’ is a 2005 British-American stop-motion-animated musical fantasy film. Soon after, websites in India, and the United States started to cover the story. There are several contradictions as the Belgian website listed Tabar as being 22 years old, but other news sites have reported that she is only 19. Some others also claimed that she is 29. The source of information for most of these sites was Tabar’s official Instagram account on which she has nearly 500,000 followers. “Dear followers … I must say I only had one surgery, not 50 surgeries, and foreign websites and channels were very biased in the way they talked about my photos. I thought these people are probably living in the 18th century and they haven’t seen or heard of technology or makeup and they are really surprised,” reads the post. As she talks of technology and makeup, it may suggest that her photos might have been digitally altered, and she may achieved the bizarre look in the images partly via the application of cosmetics or prosthetics. 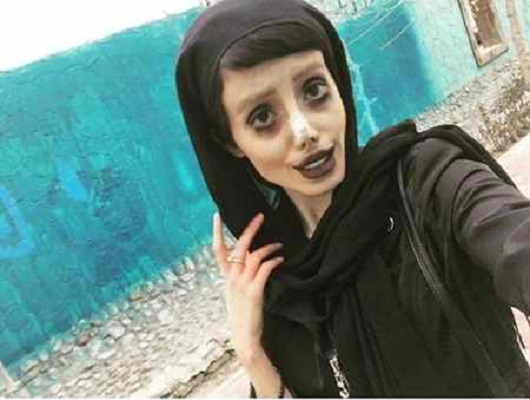 The many articles about this Iranian girl come as there is no quote from a direct interview with her. On the other hand, there is no post from her on social media affirming the number of surgeries, her dieting, or if her actual motivation was to resemble Hollywood idol. The British newspaper The Sun has published a video of Sahar in which she speaks Farsi, but there is no mention of Jolie’s name. Like many other viral stories, Sahar Tabar’s story was circulated without paying attention to the important matter of sourcing. The only thing, which is focused by the foreign media, are the weird pictures. All in all, nobody can firmly conclude that she indeed used Jolie as a model, or to what extent she has undergone cosmetic surgeries. Why you are spearing fake news!